We are the premier provider of Pitney Bowes® and Formax® folder inserters and mailroom equipment in the Pacific Northwest. Because our quality control standards are high, our sales people and service technicians are among the best in the business. Our goal is to provide a knowledgeable and value able assessment of your mail room requirements to help you streamline your processes. Don’t waste any more valuable time and money manually folding and inserting. Automate your mailings with the FD 6102 and maximize your company’s efficiency. User friendly color touchscreen display withstep- by-step setup guides. Processes up to 1,360 letters per hour. Whether you send out a few hundred pieces or a few thousand, your monthly mail is huge to your business. 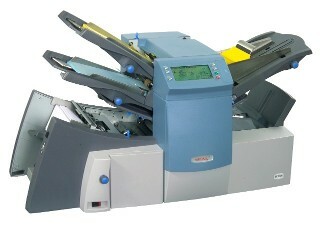 The Relay 2000 inserter offers a proven, easy to use platform that delivers fast, accurate and affordable mail assembly. So you can get back to running your business. For the first time, the Relay 2000 inserter allows businesses with small mail programs to take advantage of Optical Mark Recognition (OMR) technology. Previously available only in larger, more expensive inserters, OMR lets you process mail with far greater accuracy, without sacrificing speed. It also means you can easily manage variable page mailings without the need to sort page counts by hand. Processes up to 2,500 letters per hour. Sheet feeder capacity up to 325 pages. Insert feeder capacity up to 100 inserts. Envelope feeder capacity up to 100 envelopes. 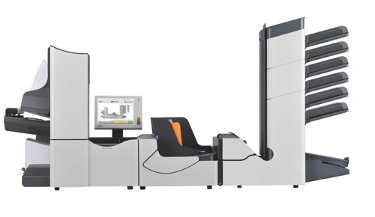 With the DI 380/DI 425 Inserter Series, you get a seamless mailing process. Collating, folding and inserting are automated. Bills and statements go out promptly. Optical Mark Recognition (OMR) helps to ensure that customers receive the correct marketing and financial documents. When used with a DM Series™ digital mailing system, inserting and mailing are integrated. This powerful combination brings benefits that flow through to the rest of your business, giving you uninterrupted time to develop new business opportunities. Processes up to 3,500 letters per hour. 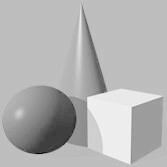 Simple, intuitive programming and control.. 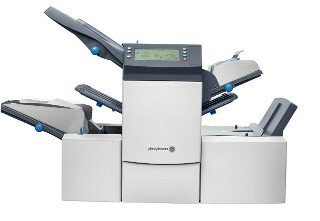 The 6204 Series brings advanced folding & inserting technology and flexibility to the office environment. A large, color touchscreen control panel with wizard job feature easily guides operators through setup and operation. AutoSetTM allows for one-touch setup of new jobs by automatically measuring paper lengths, envelope sizes and fold lengths. Recurring and frequent jobs run in AutoSetTM can also be stored as one of 15 jobs accessed with the push of a button. The powerful folding system enables the 6204 Series to accurately fold up to five sheets of paper at the same time. Four configurations are available to meet your processing needs. The FD 6204-Basic 1 offers one automatic sheet feeder. The FD 6204-Basic 2 model is equipped with two automatic sheet feeders. The FD 6204-Advanced 1 model has one sheet feeder and one insert/BRE feeder. The FD 6204-Advanced 2 comes with two sheet feeders and one insert/BRE feeder. The 6204 Series Inserters offer the power and reliability of larger machines with the ease of operation expected and required for the office environment. The DI500 FastPac™ Inserting System is a very efficient system with superior throughput that’s easy to use. The state-of-the-art PacPilot™ user interface offers easy setup and job switching limiting the need for training and maximizing workforce flexibility. With superior loading capacity in the envelope, sheet and insert feeders, throughput and uptime is increased significantly. Maximum flexibility with 2 sheet feedersand 1 insert feeder. Insert feeder capacity up to 300 inserts. Envelope feeder capacity up to 300 envelopes. DI500 OMR supports all basic and advanced tabletop inserter OMR. Twenty programmable job presets to simplify your regular mailings. The 6306 Series Inserters combine user-friendly features with high productivity. Five models are available to meet the needs of any size office or small mailroom. A variety of input configurations includes a high-capacity document feeder for up to 725 sheets, a high-capacity production feeder, standard and special feeders, and short feed trays. Users can store up to 50 programmable jobs for efficient and hassle-free set-up and operation. 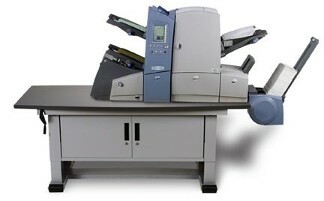 Standard features include a 7" full-color touchscreen control panel with graphical interface, high-capacity vertical stacker which holds up to 500 finished envelopes, automatic paper and envelope presence sensors with indicators on the control panel, and a large top-loading envelope hopper with a capacity of up to 400 envelopes. The 6306 Series also includes an eco-friendly sleep mode which saves energy by automatically putting the inserter into standby mode after 1 hour of being idle. CIS scanning technology covers the full width of the doucment feeders and accurately reads OMR, 1D and 2D barcodes printed in any location on a document. Optical Character Recognition (OCR) is also available, which uses page numbering in 1/1 or N-of-M format to ensure each set is complete before being inserted into an envelope. The 6306 Series is powerful enough to fold up to 8 pages in tri-fold and up to 10 pages in half-fold modes. Its versatility allows for processing forms of various lengths and thickness all at the same time, up to 3,800 per hour and up to 40,000 pieces per month. Options include a production feeder which holds up to 1,200 sheets or 325 BREs, Advanced OMR and BCR, Formax MailDocTM Software, and a side exit tray for up to 400 filled envelopes. Processes up to 3,800 letters per hour. Allows 50 programmable jobs for setting common insertion tasks with the touch of a button. Load documents up to 8 pages thick. The versatile 6404 Series adapts to most any folding and inserting application. Models are available with 2 - 6 stations, offering the flexibility to meet your specific needs. A variety of input configurations include a high-capacity document feeder for up to 725 sheets, 1 or 2 high-capacity production feeders, standard and special feeders, and short feed trays. 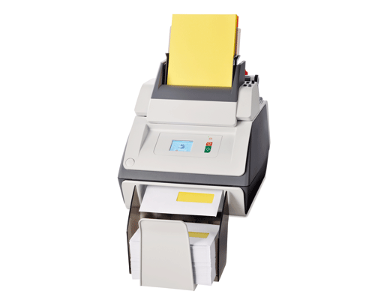 The 6404 Series is capable of folding and inserting top, middle and bottom-address documents into top-flap envelopes. 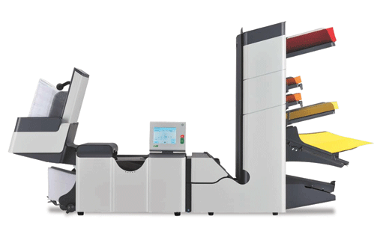 Standard features include a full-color touchscreen control panel, a large output stacker which can hold up to 500 filled envelopes, and a large top-loading envelope hopper with a capacity of up to 325 envelopes. The 6404 Series also offers energy savings with its auto standby mode, which goes into effect after 1 hour of idle time. Options include Barcode Recognition (BCR), Optical Mark Recognition (OMR), a variety of output choices, cabinets and 402 Series Joggers. The versatile 6606 Series adapts to most any folding and inserting application. Models are available with 2 - 7 stations, offering the flexibility to meet your specific needs. A variety of input configurations includes a high-capacity document feeder for up to 725 sheets, 1 or 2 high-capacity production feeders, standard and special feeders, and short feed trays. 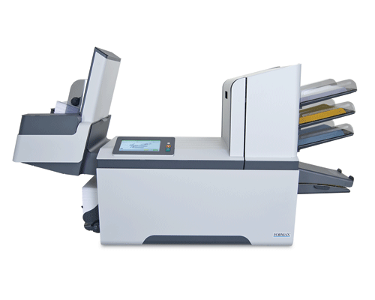 The 6606 Series is capable of folding and inserting top, middle and bottom-address documents into top-flap envelopes. Standard features include a large reversible full-color touchscreen control panel with a graphical interface, automatic paper and envelope presence sensors with indicators on the control panel, a vertical output stacker which can hold up to 500 filled envelopes, in addition to a large top-loading envelope hopper with a capacity of up to 500 envelopes. The 6606 Series includes an energy-saving feature which automatically puts the inserter into standby mode after 1 hour of being idle. Various levels of Barcode Recognition (BCR) and Optical Mark Recognition (OMR) are available and feature CIS scanning technology, which can scan codes printed in any location on a document. Optical Character Recognition (OCR) is also available, which uses page numbering in 1/1 or N-of-M format to ensure each set is complete before being inserted into an envelope. Additional options include a thin booklet feeder for up to 325 inserts, high-capacity output conveyor and envelope hopper for up to 1,000 envelopes each, side exit tray, cabinet and 402 Series Joggers. Processes up to 4,300 letters per hour. Accepts up to 7 feeder stations. Huge 10.4” color touch screen for simple, intuitive programming and control. 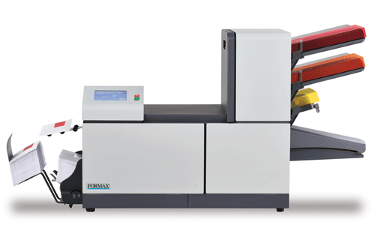 Handles up to 3,000 sheets and 1,000 envelopes in a single feed load.